India's biggest property developer, Dehli Land and Finance, is the driving force behind DLF City in Gurgaon, a new town that lies to the south of the nation's capital city. Though golfers with an interest in cricket may also have heard of DLF through their promotion of the Indian Twenty20 Premier League. The DLF Golf & Country Club started out in life in 1999 when an 18-hole Arnold Palmer-designed parkland course opened for play. The course was constructed to the highest specification with top of the range irrigation and drainage systems installed. In addition to the planting of almost 15,000 trees, 195 floodlight pylons were installed to allow all 18 fairways to be illuminated at night – now that's what we call maximising your golfing resources. DLF played host to the 2008 Johnnie Walker Classic, this was only the second European Tour event staged in India – Delhi Golf Club hosted the first event. The European Tour returned to India for the inaugural 2010 Avantha Masters, won by Australia’s Andrew Dodt. In 2011, Calcutta-born SSP Chowrasia claimed the Avantha Masters title. In 2014, new land became available, so DLF commissioned Gary Player to build a brand new course. Player Design built nine new holes on the newly acquired land and then incorporated and refashioned nine of the existing Arnold Palmer-designed holes into a totally new configuration, which opened for play in October 2015. The facility now has 27 holes at its disposal, the 18-hole Gary Player course and a 9-hole Arnold Palmer course, which still retains its floodlighting for those seeking a night time golfing experience. The new Gary Player course is a tough test, too penal according to some commentators. The layout is routed in thrilling fashion around two large lakes (there’s even a par three with an island green), where dramatic landforms, including bold rock formations of a former quarry, create an unforgettable closing finale. Player’s Lake & Quarry nines are certainly bold and brassy but the average handicap golfer will need to bring a sense of humour and an arsenal of golf balls. We suggest leaving the 7,654-yard tips for the pros, otherwise even good humour won’t be sufficient. In 2015 DLF hosted the inaugural Hero Indian Open, the tournament has remained at the club ever since. The original 18-hole Arnold Palmer designed DLF Golf Club in Gurgaon had been consistently ranked as the best course in India. In the past it has hosted many European and Asian sanctioned tour events. That all changed in the last two years with some very dramatic upgrades to this property. DLF has kept nine holes of the original rotation the same which still affords you the unique experience to golf at night under the lights. However In 2013, the new Gary Player Signature nine opened for play to great acclaim. This spectacular amphitheatre design offers very uneven fairways with plenty of dramatic deep-faced bunkers. There are many signature holes here but I would narrow them down to the island green 14th and the daunting 9th hole that hugs their huge lake and utilizes the rugged Aravali Range and the 30,000 square foot teak and sandstone clubhouse as the backdrop. My biggest thrill was that I was fortunate enough to tour his newest nine just days before it actually opened for play. The greenskeepers were just completing the final touches in preparation for the Hero Women’s Indian Open, part of the Ladies European Tour, on Oct 25/15. Rookie Emily Kristine Pedersen eventually won the maiden title in India. The Player team reportedly moved over 200 million cubic tons of earth and brought in 27000 tons of indigenous dholpur to form rock quarries and stone pillars as a stunning backdrop. They planted thousands of trees to reduce the carbon foot print, incorporated- unique looking Geo-textile bunkers to reduce maintenance costs and used recycled treated water fed from the lake for irrigation. Senior Designer, Jeff Lawrence commented that “this course is designed to not only create a fun and enjoyable golf outing for the members of DLF Golf and Country Club, but also to host championship events,” and I couldn’t agree more. 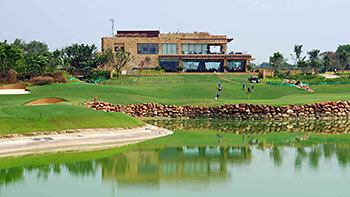 There is no doubt in my mind that the DLF Golf Club will be once again reign supreme in India. Even though the greens appear to be the toughest on the planet, I can’t wait until next March for my opportunity to play this gem in its entirety. This isn't a course review, it's an advert. Surely the website charges for promotions from travel agents?